I put the blame squarely at the feet of the match officials for a sad weekend in the history of cricket, with Pakistan forfeiting a Test after allegations of ball-tampering. Umpire Darrell Hair's previous record in officiating matches involving Asian teams is pathetic and his decision to finish the game was not good for the game or the players. I completely agreed with the decision made by Pakistan captain Inzamam-ul-Haq - a highly respected figure in the game - to stay in the dressing-room as a protest. Cricket is a game of friendship, a gentleman's game, and match officials have a big part to play in upholding that. In my dealings with Hair he has always come across as a policeman rather than a judge - his body language says everything. 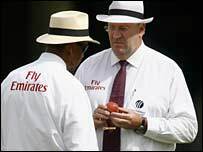 The umpires have to inspect the ball after every over to check for damage. If they thought it had been tampered with why did they take so long to change it? Firstly, it seems ball tampering issues only ever seem to crop up against Pakistan. Every team uses reverse swing - when it happened for England during last year's Ashes it was considered an art, not cheating. I played many times at The Oval and the ball tends to become rough around the 30-over mark. The umpires' allegations came after 56 overs. If there were a scratch, like that caused by a bottle top or a fingernail, you can say it has been tampered with. But the Pakistan players I spoke to on Sunday night said there was no scratch on the ball. Despite there being so many TV cameras, there were no pictures that showed anyone tampering with the ball. Secondly, at no time did the umpires tell Inzamam to be careful with the ball - they changed it without warning. On our last two tours of England in 1996 and 2001, if the ball became a little rough the umpires would call over the captain and warn him. My club team in England, Lashings, has Test players from all over the world - West Indians, Australians, New Zealanders - and everyone disagrees with Hair's decision. Throughout this tour, Pakistan and England have enjoyed good relations, and while they will be strained at the start of the one-day series I expect that to settle quickly. But it will be very difficult for Pakistan, and Inzamam, to deal with the pressure as the tour continued. In the meantime, the International Cricket Council needs to learn lessons from what has happened here. So many people are involved, thousands are at the ground and millions are watching at home but one man has so much power.